Something that I failed to do on the walk was upload a video. I tried. It just didn’t work. So, now that I have had a few hours at home to fuss around with it, I am trying it in two different ways. The first is a direct upload, which, during the walk, kept blowing up on me for file-size reasons. I got around it now – it’s complicated, though. Then, I created a ‘YouTube Channel’ for myself. Both methods are included above. I want to see which works better. What looks better to you? – It is certain now that YouTube stardom awaits me! Because of my problems posting it during the walk, this is the only video that I shot on the trip. I wanted to “vlog” on one evening in a pub, but I had to give up this ambition for the afore-mentioned technical reasons. Anyway, I shot the above video while we were walking along this valley, which I am guessing is Ullswater Valley (I somehow lost track of where we were). You will see and, especially, hear the chorus of sheep baaing, reverberating as if the whole valley were an amplifier. I am home in Le Roy now. Actually, it has been almost a week. It is good and a little sad, at the same time, to be home. I have several projects and plans for the summer, but I am feeling an emptiness. Planning the walk, walking the walk, writing my posts about the walk, it all stopped all at once, and now I feel a little disorientated. 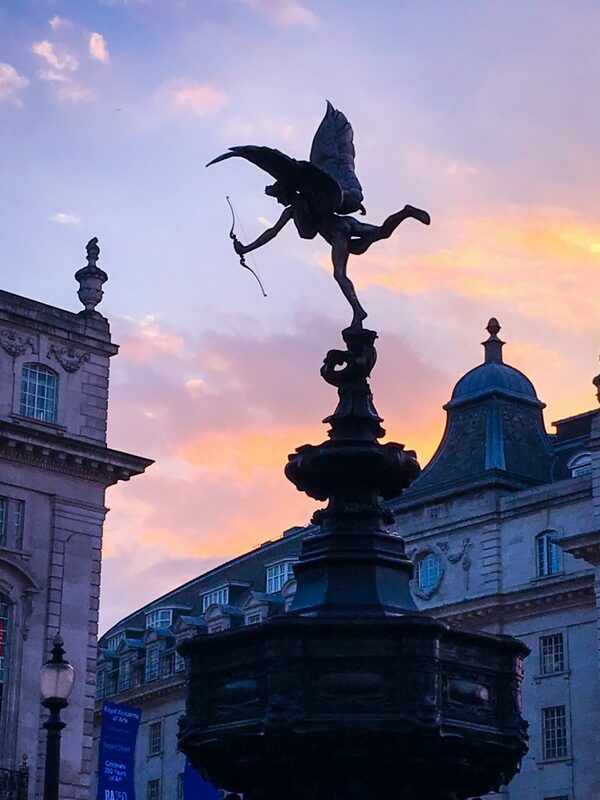 In London, I did some of my favorite “London things.” I went to the British Museum, I went to a play, I went to a favorite restaurant, I met an old friend for dinner, and we established that we hadn’t seen each other for about 12 years, though we email and Facetime fairly regularly. I could spend weeks at the British Museum, but I only had a few hours this trip. My feet were still incredibly sore from the walk, so part of my time there was seeking out benches and plopping myself down on them. 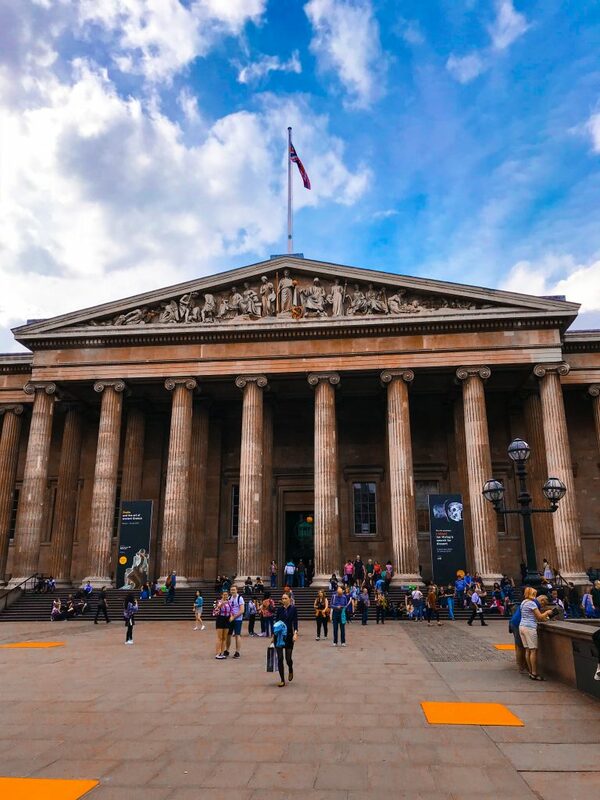 I decided to hit some of my British Museum highlights (to be honest, I am not unique in my highlights – they belong to the Museum’s greatest treasures) – i.e. the Sutton Hoo Helmet (7th century), the Isle of Lewis Chessmen (12th century), the Rosetta Stone (196 BC), and a few other amazing objects. The Sutton Hoo treasure was found on the eve of World War II in 1939, and was left in the ground to protect it. It was then escavated and displayed in 1946. 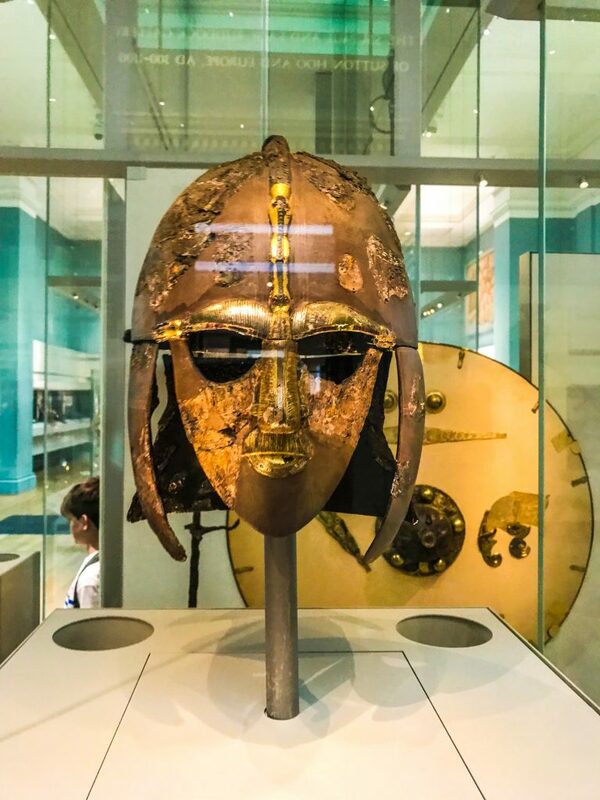 The collection of 263 objects included weapons, silver cutlery, gold buckles, coins, and a distinctive full-face helmet, of a kind never before found in Britain. Examining the artifacts, they concluded that the burial was not Viking, as first assumed, but Anglo-Saxon. One theory is that the burial belonged to Rædwald, King of East Anglia, who died in 624, and whose reign coincides with the dates of the Sutton Hoo treasure. 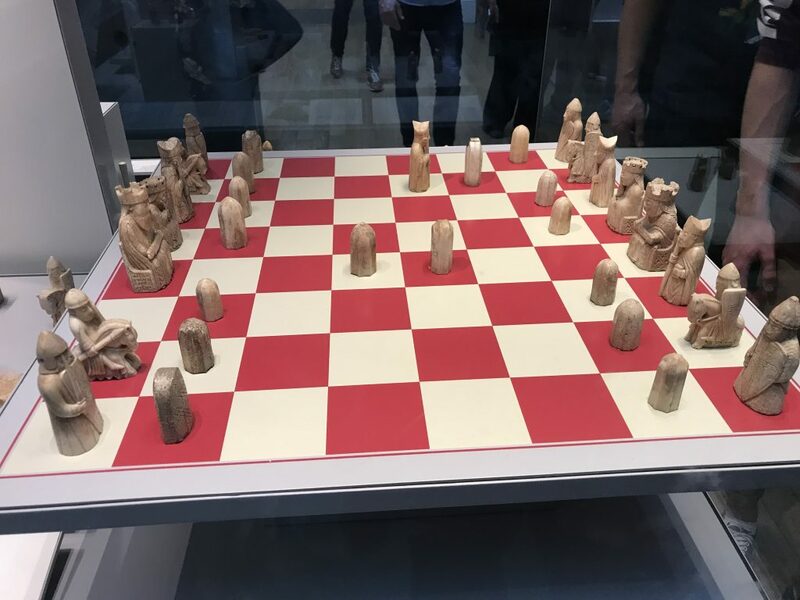 The Lewis chessmen are a group of 12th-century chess pieces, along with other gaming pieces, most of which are carved from walrus ivory, discovered in 1831 on the Isle of Lewis in the Outer Hebrides, Scotland. They are some of the very few complete, surviving medieval chess pieces. Being a chess player, I particularly like this display in the Museum. When found, the hoard contained 93 artifacts: 78 chess pieces, 14 other gaming pieces, and one belt buckle (thrown in for good measue, I guess). Today, 82 pieces are owned and exhibited at the British Museum, and the remaining 11 are at the National Museum of Scotland in Edinburgh. I would like to buy a replica set of these pieces. I will need to think about it. I don’t know where to display it. 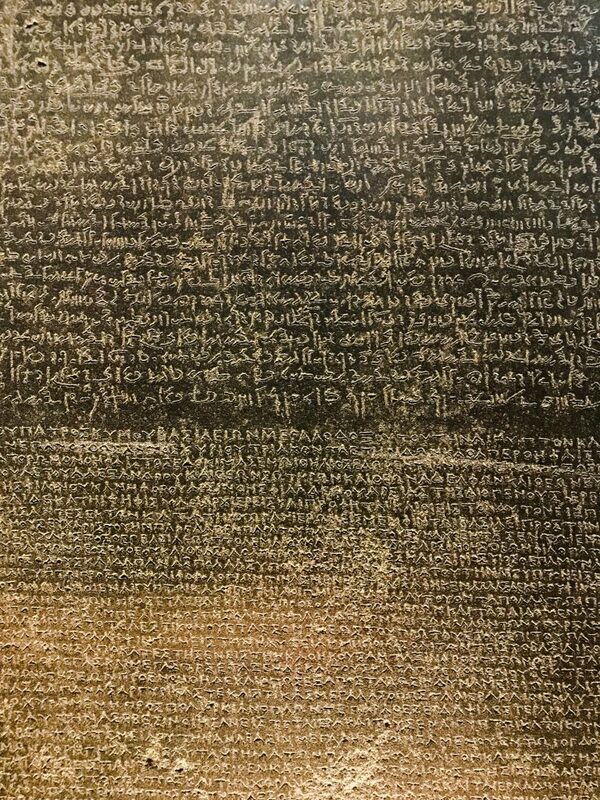 The Rosetta Stone was found in 1799, inscribed with three versions of a royal decree issued in Memphis, Egypt (not Tennessee), in 196 BC . The top and middle texts are in Ancient Egyptian using hieroglyphics and Demotic script, while the bottom is in Ancient Greek, which was able to be read at the time of discovery, and this held the key to the first-time deciphering of Eygptian hieroglyphics. It still took 20 years to crack it. What I didn’t realize was that it was rediscovered there in July 1799 by the French during the Napoleonic campaign in Egypt, but then the British defeated the French there in 1802, so they took the Stone! It is, now, likely the most visited item in the British Museum – rather than, almost, the Louvre. A Frenchman, though, cracked the hieroglyphic code around 1822. 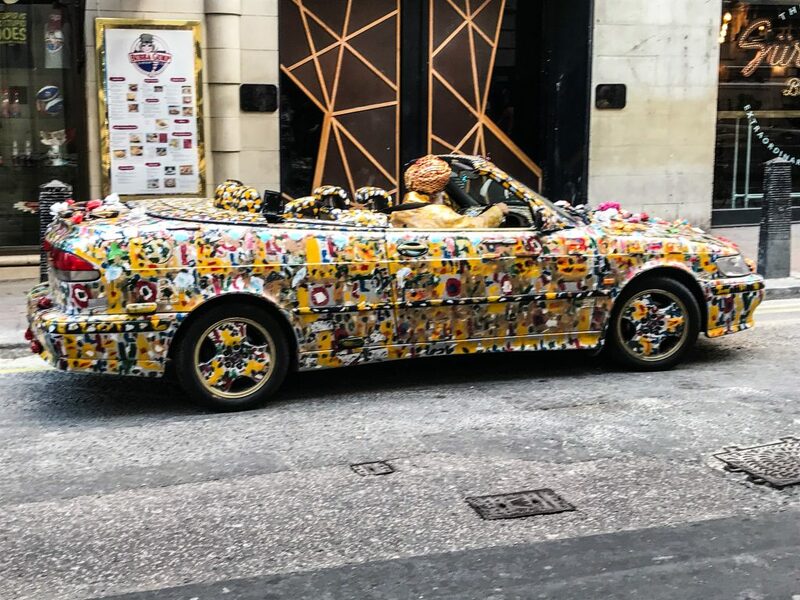 In London, you can see something every day that you just don’t see every day! 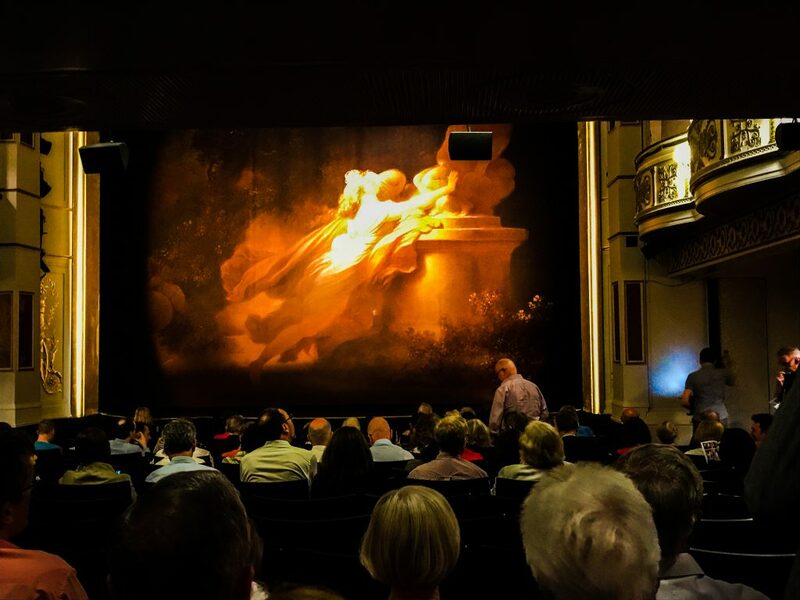 The play I saw was “An Ideal Husband” by Oscar Wilde, who may be as funny today as he was during his own time. Two of the main actors were a famous real-life father and son team, playing a father and son in the play – Freddie Fox as Lord Goring and Edward Fox as the father, the Earl of Caversham. 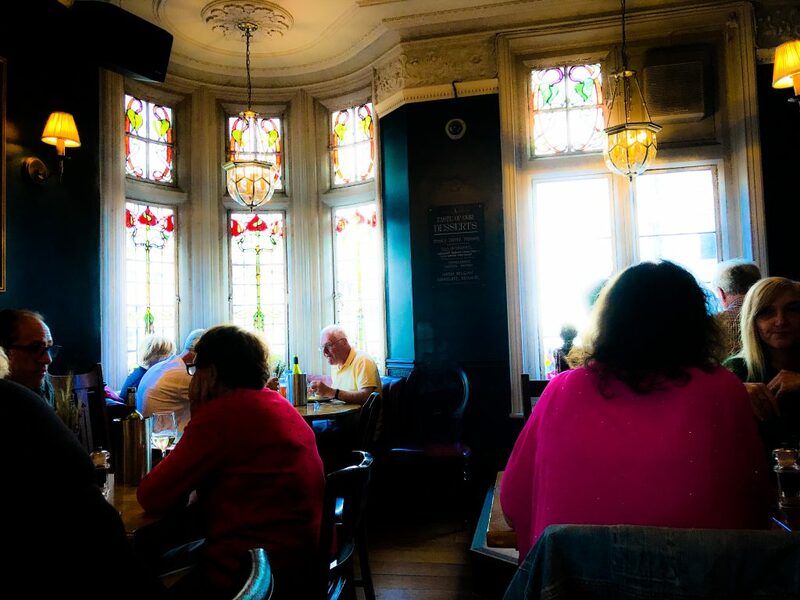 Beforehand, I had dinner at the Wellington Pub on the Strand, an Edwardian gem, not far from the theatre (notice my spelling just got British!). 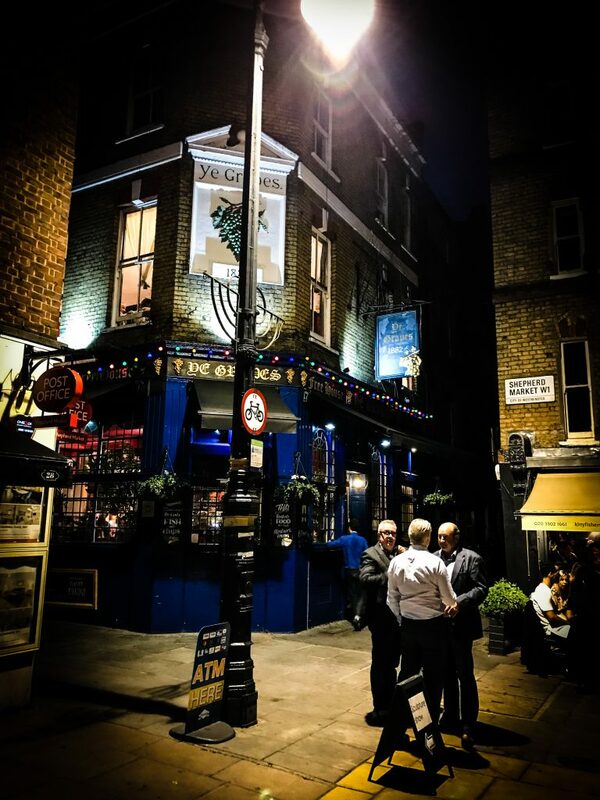 The Wellington – Traditional pub with original Edwardian ceilings and wooden bar. On another night, my dinner out was at an old favorite restaurant of mine in Shepherd Market, Mayfair – Le Boudin Blanc. It was good, as I remembered it was. However, when the check came, I also remembered that this was a favorite restaurant at a time when I was gainfully employed. Oh well! Sometimes, you just have to grin and bear it, and also still enjoy it. So, I did. I started writing this post on Friday, but I kept getting interrupted, or, rather, I would Interrupt myself. I put together a Barbecue. Why do they put customers through this? Why don’t things come assembled anymore? I also went through emails and paid bills. I looked at my rooms and thought hard about maybe straightening them up sometime. Then, I had an upset. 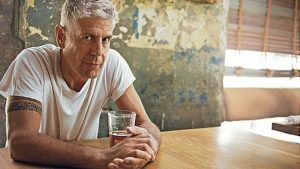 I heard that Anthony Bourdain had died, apparently by suicide. I have to write about it here. It was a surprisingly hard hit for me, I was a big fan. I thought what a life he lived, what adventures he had – and he earned a good living doing it and he was famous for doing it. But, it was mainly the way he experienced the people and places he visited that moved me. I thought, I would like his life. His entrée into people’s lives and culture was often through the food they ate, because that was his background, but, of course, he observed and discovered far more. He reported about people and cultures with such honesty. When I think more of the episodes in his “Parts Unknown,” I believe, yes, in fact, it was a very heavy honesty. He saw and felt things deeply. Bourdain, himself, admitted that he was restless, that he couldn’t stop. I read that he was on the road 250 days a year. When I think of this, I get a picture of a glass that can’t be filled, no matter how much is poured into it. Maybe, I was hit hard by the news, because I have sometimes this restlessness, too. The stats for suicide are scary. Since 1999, the overall US suicide rate has increased by 25%! But, depression can be treated and does in the vast majority of cases pass. I wish that Anthony Bourdain had found the help he needed. He knew so many amazing people. How did his illness go so unchecked? Okay, I don’t mean to end my post on such a sad note. But, it is 1:30 AM and I want to “publish” this finally, so maybe I will have to end this way. Sorry. – I do plan to post again, but I would like to think first about what I will do next. Most logical would be another walk. 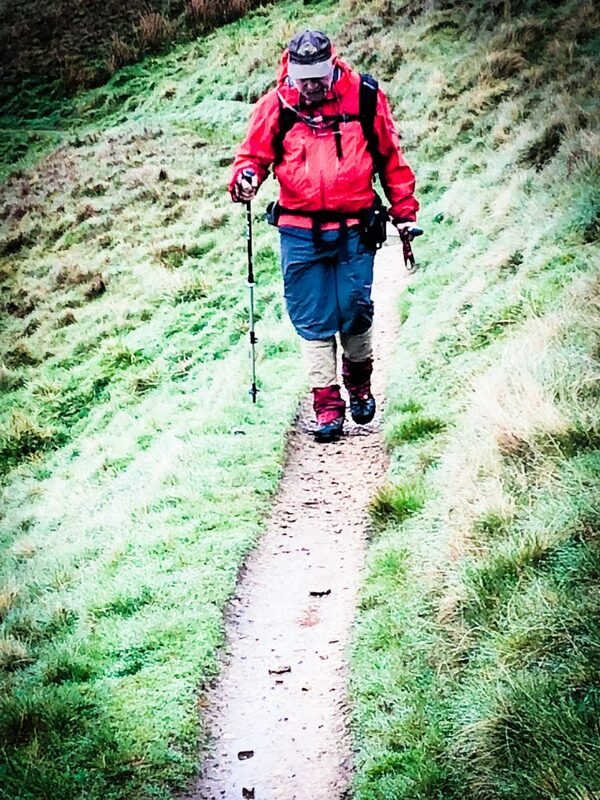 After all, my site is called “A Long Walk.” But, maybe, I will have another idea. I will sign off for now. Next Next post: A Pre-Walk Post!